Another prominent Filipino politician has made it to the cover of Esquire Philippines. This time it's Senator Grace Poe, daughter of the late Fernando Poe Jr. and Susan Roces. Ms. Poe will be appearing on the December 2014-January 2015 issue of the magazine. In the cover story, Poe sat down with Esquire to talk about her plans for the next five years. Esquire Philippines posted the following tidbit on Facebook as to what the cover story will be about, "What do the next five years hold for Senator Grace Poe? The potential Presidential candidate sat down with ESQUIRE to talk about alleviating hunger, fixing the energy department, and how we’re better off now than four years ago." The cover art for the magazine featured a minimalist design that's been inspired by one of the most iconic print ads ever made, the Think Small advertising campaign by Volkswagen for their their car Beetle. The ad was created by Helmut Krone in 1959 at the Doyle Dane Bernbach advertising agency. The copy for the ad was written by Julian Koenig. The campaign has been tagged as one of the best advertising campaigns in the 20th century. The Esquire cover looks very similar to the Volkswagen ad. Instead of the Beetle, there's Senator Poe in her black dress. And instead of the tagline Think Small, there's Think Grace. According to Esquire Philippines, the cover is a homage to the Volkswagen ad. The magazine also stated that the cover was brainstormed by guest editor David Guerrero. 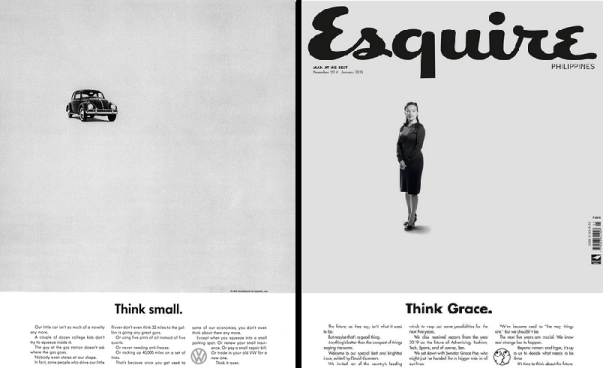 The iconic Volkswagen ad (left) and Grace Poe on the cover of Esquire (right). It can be recalled that Esquire Philippines drew a lot of flak last month when they featured Mar Roxas (another prominent Filipino politician) on their cover. Roxas is the current Secretary of the Department of Interior and Local Government. Other personalities featured in the December-January edition of Esquire Philippines are Benjamin Mendoza (the Bolivian artist who tried to assassinate Pope Paul VI when the latter visited the Philippines in 1970) and Eugene Torre (the chess master).